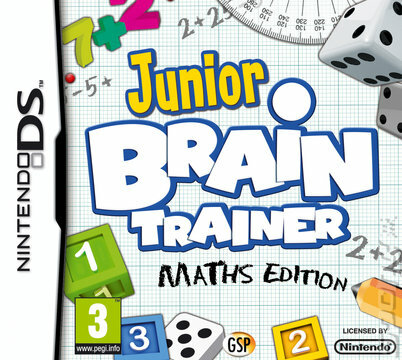 Both Junior Brain Trainer and Junior Brain Trainer 2 contain maths and number puzzles interspersed among the word and literacy games; Junior Brain Trainer: Maths Edition, on the other hand, is from a different developer and focuses only on the numbers side of things, providing 15 all-new maths puzzles separate from the other Junior Brain Trainer games. A dedicated maths edition was a good move as maths is slightly more universal and boundless in terms of age. Despite being having a recommended age bracket of 7-11 years, this has potential to extend with maths as doing simple mental arithmetic calculations can still be fulfilling as you just do them faster. The same isn’t the case for English puzzles though, as when these are simple, no matter how many of them you are racing through under timed conditions, they can still seem unsatisfying. As a result of having a different developer to the other Junior Brain Trainer games, Junior Brain Trainer: Maths Edition takes a different approach to training young minds. Instead of going for a Dr Kawashima-esque layout of your daily training visit, which in turn unlocks other mind challenges to play, this game is an adventure with an abundance of rats. 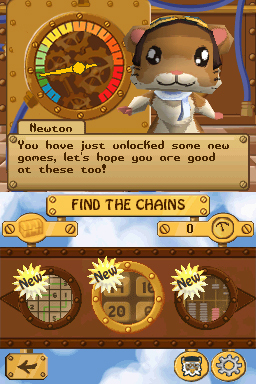 You play as a young rodent called Newton, and after the evil Count Ratatrax imprisoned all the furry inhabitants of Rodentown for his experiments, you must find a way to free everyone. Yep, you guessed it! Solving the maths and logic games is the solution to setting your innocent community free. Completing each of the fifteen challenges unlocks a new piece of an aircraft, which with the help of a wise old rat called Flanagan, you will build to provide a means of escape. 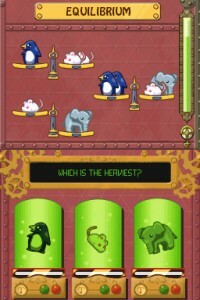 You are given a choice from the three standard difficulty settings upon starting your data: easy, medium and hard. Three data slots allow two others to create save files or, alternatively, let you create a data for each of the three difficulty settings. As well as making the puzzles themselves harder, (such as introducing division and multiplication symbols into calculations), going for the higher difficulty settings increases the set amounts of points required to unlock the next set of games or win a ship part, and the combined challenge of a higher point requirement and more difficult puzzle, all done to the pressures of a time limit, make the game more than enough challenge for 7-11 year olds. 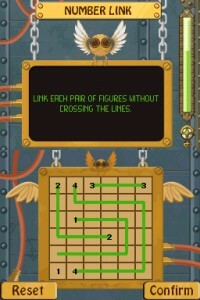 You must be speedy and also correct as wrong answers affect your final score and chances of receiving a piece of the aircraft, and not only does the level of challenge mean those who aren’t necessarily ‘juniors’ can enjoy the game, but it also brings up the question of whether it could be too difficult for 7 year olds to complete. Certainly they will still be able to enjoy and make use of the software, but given that the different mini-games are unlocked in sets of three once you have hit the target with the previous three mini-games, younger players could have trouble opening up the rest of the game, significantly dwarfing the already brief adventure. With only 15 games on offer, it is a relief that all of them are fairly strong. Many have you completing calculations by inserting the missing numbers/symbols, or finding the sum of the calculation, although some are more logic based puzzles. Some games can be difficult to understand as there’s only a short explanation before each game, but fortunately, the booklet has a rundown of each individual game which should help if any problems knowing what to do arise – quite likely given that many young kids nowadays might not have come across an abacus or know what to with dominos. However, some puzzles have slightly deeper problems than initial understanding, problems relating to errors in their design. Firstly, some games don’t have a back button or a way of cancelling and re-doing your first answer, meaning you have to take the points deduction of a wrong answer despite knowing that the answer you’re submitting is wrong. It’s a silly gripe to have with the game because a handful of the games do have a cancel or undo button included, proving it could have quite easily been done for the others. Secondly, a problem which relates to the ‘Mystery Number’ game, one of the first you will meet, is that the game can have some trouble recognising your writing, hence misinterpreting the numbers you write unless you do it their specific way. For example, when doing a ‘4’ you must do it joined up as a singular motion because taking your stylus off of the touch screen will cause it to see the downward swipe to cross your ‘4’ as a ‘1’. Overall, Junior Brain Trainer: Maths Edition isn’t a bad brain training tool, as the incentive based rewards of ship parts as you try to build your aircraft and complete the adventure means you do the challenges before you fully realise, or more importantly the kids fully realise, that the challenges completed were actually maths. 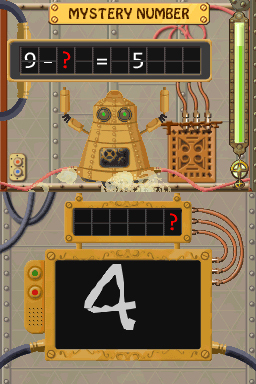 The fact that it is all maths – along with a slightly mismatched difficulty given that 7 year olds are supposed to be able to complete it – mean that the game’s bearable even for non-juniors, and of course the short-ish 15 puzzle adventure lasts a little longer in younger hands.